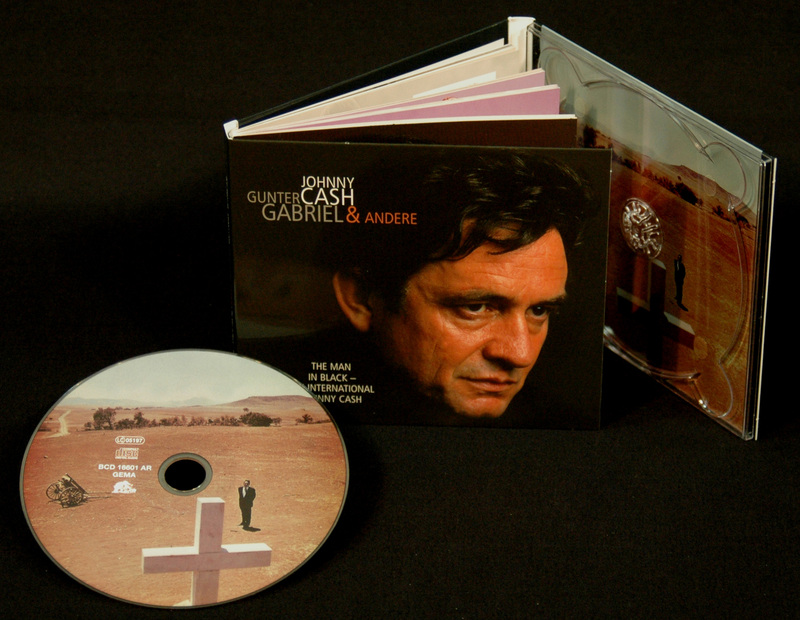 1-CD-Album Digipak (6-plated) with 58-page booklet, 26 tracks. Playing time approx. 74 mns​. 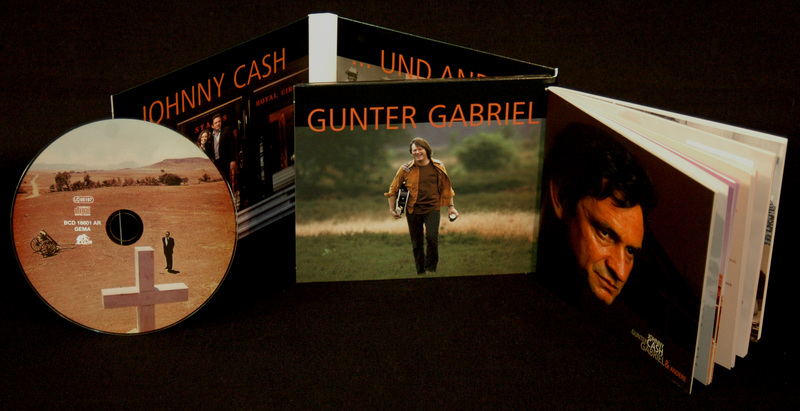 Part 1 finds Gunter Gabriel singing 11 Johnny Cash hits in German. 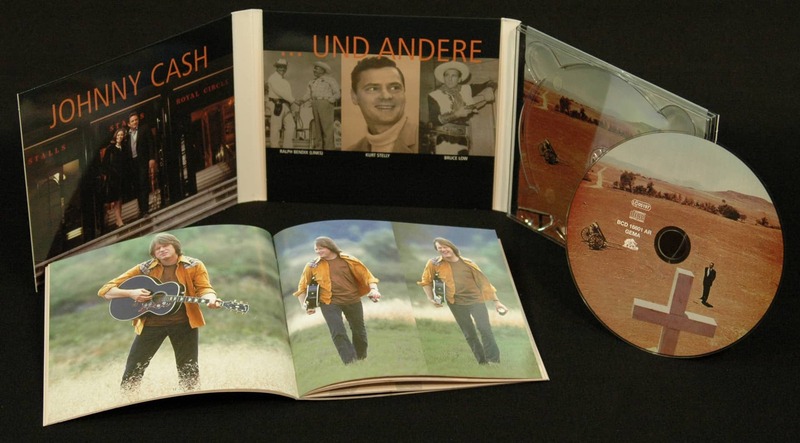 In Part 2, Johnny Cash himself sings in German and Spanish. 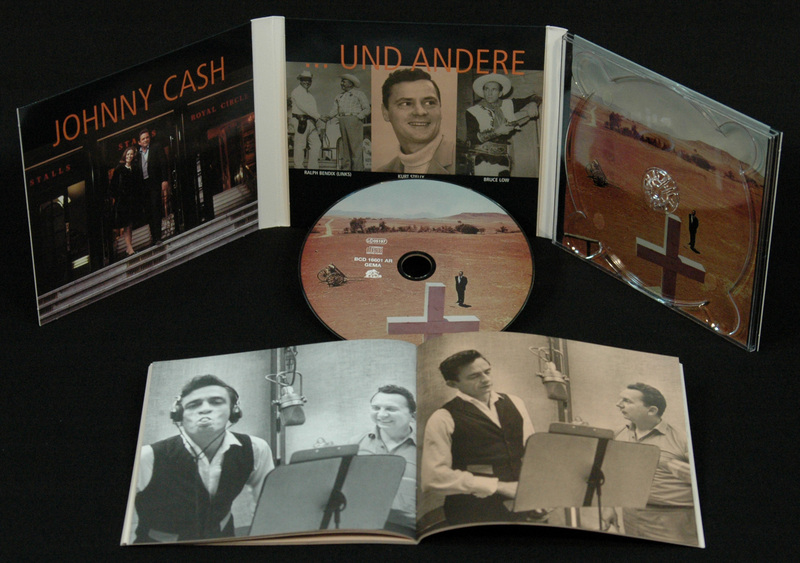 The last part features German artists interpreting more Johnny Cash songs. 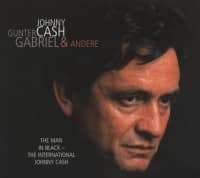 Johnny Cash: He was the pinnacle of my life. It was back in 1980. We sat in the dining-room in his house in Hendersonville on Cumberland Lake near Nashville. His parents were there; his daughter, Rosanne; June Carter’s daughter, Carlene; Johnny’s guitar player, Bob Wooten, and his wife, Anita Carter (June’s sister); and me. I was an aspiring country singer and the guest of honour that night. Black waiters with white gloves were serving southern chicken. On my right June arose to offer up a prayer. I was excited because Johnny was seated right across the long table from me. June was in rare form. She spoke about America and Russia, about Kruschev and Kennedy, about the maize harvest, the lack of water in Senegal, the hungry kids around the world, and then back to country music, Nashville and peace on earth. This took quite a while. Johnny sat there waiting, his mighty head buried in his right palm, and did not say a word. I can’t remember what was more stirring to me – the chicken aroma (did I mention I was very hungry?) or Johnny’s presence. I had arrived at a spiritual journey’s end. Twenty-five years ago in my small hometown’s municipal swimming pool I remember I Walk The Line blasting out of a cheap transistor radio. Then the DJ said, “That was Johnny Cash.” That was it! I had learned about rock 'n' roll… Elvis, Little Richard, Jerry Lee Lewis. But now there was Johnny Cash. He was completely different, singing about workers, prisoners. It was like John Wayne on record! The Cold War was raging in Europe. We had singers like Rudi Schuricke, Gerhard Wendland, Caterina Valente and the first records by Freddy Quinn, but those guys from across the ocean were different from anything we’d ever known. Different lyrics, different rhythms…just totally different. Elvis made me play guitar, but Johnny made me a songwriter. I will never forget Rock Island Line, even though I didn’t know exactly what it was about because my English came straight from a dictionary and a formal grammar book. Johnny Cash has accompanied me through my whole life from the time I first heard I Walk the Line. I have all his songs – on vinyl, CD, and cassette. I have all the sheet music and countless written pieces of paper. I needed him like a psychiatrist. I heard him in the morning while I had a shave, and at night on the autobahn. I admire his art and I admire the man himself. I rank him alongside Doctor Albert Schweitzer. Following my first visit to Nashville, we met every time he was on tour in Germany. In the tour bus from Hamburg heading south across Luneburg Heath, June was reading aloud from the Bible while Johnny clasped the bus rail with one hand and held a video camera in the other. I remember when he was on stage at the Cologne Sporthalle and said, "Come onstage, Gunter, let us sing a song.” There was always something special around him one could not escape. We used one microphone the way John Lennon and Paul McCartney did. We sang St. Quentin, but I would have sung Silent Night with him. It was marvellous. It was an honour for me. The peak of my life. "Johnny Cash & Gunter Gabriel"
The man singer with the guitar. Just a moment ago the big Gunter GabrielBlonde had to sign an autograph between a salad plate and an apple juice spritzer. On a white paper napkin. At noon Gunter Gabriel often eats here, at Klaus', in a snack bar somewhere in the labyrinth of Harburg harbour. Klaus, the innkeeper, always has good things on his menu, home cooking and fried food and his prices are cheap, says the lunch guest in the washed-out black jeans and the pointed cowboy boots. He likes it. Everybody in this pinte knows him, at least from TV. Everybody calls him by his first name: "Hey, Gunter, what's going on?" Gunter Gabriel is prominent, but therefore far from unapproachable. He's an anti-star. One who has nothing to fall into his lap, who has had to bite his way through his whole life, he says, while he lets himself be inspired by Klaus' homemade herb. Above all, Gunter Gabriel is one of them, the Malochern. Even though his last big hits may have been a while ago and he may have relegated from the Bundesliga to the Kreisklasse in the meantime, as he puts it, Gunter Gabriel has never been out of the window, and many fans have remained loyal to him for years. 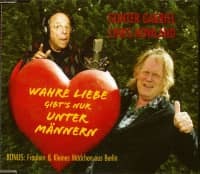 For despite all the success that rolled over him, when Gunter Gabriel began in the early 70s to capture the state of mind of the so-called "little people down there" and process it into songs, he remained a buddy; one who understands how to express what many think; one who speaks the language of the people and to whom, in return, one pats the shoulder without inhibitions. "My heroes are the women and men everywhere in the land who do the work day by day, quiet and unrecognized. My heroes are all those who often overlook. And yet basically making sure that the wheels turn" (from: Meine Helden, M+T: Gabriel, 1977) When a new CD would finally come, asks one of Klaus' regular eaters in the orange overall from the next table over. "I'm in the process of recording new footage. Just got out of the studio. But it will take a little longer," answers Gunter Gabriel. A pop singer? No, he doesn't rhyme 'heart' with 'pain', but 'differential' with 'works council election' or 'whole man' with 'highway'. Gunter Gabriel's songs are like a warm, firm handshake. A songwriter? Yes, but he doesn't let himself be nailed down politically (and he's closer to rock 'n' roll than to chanson). But he never kept his perspective on things to himself: He sang about radiation sludge from the nuclear laboratory (Der Mann hinterm Pflug, 1982) and the steelmakers' fear of impending unemployment (Rheinhausen, 1988), about German soldiers in ex-Yugoslavia (Es steht ein Haus im Kosovo, 1999) or the farewell to the D-Mark (Bye Bye Deutsche Mark, 2002). 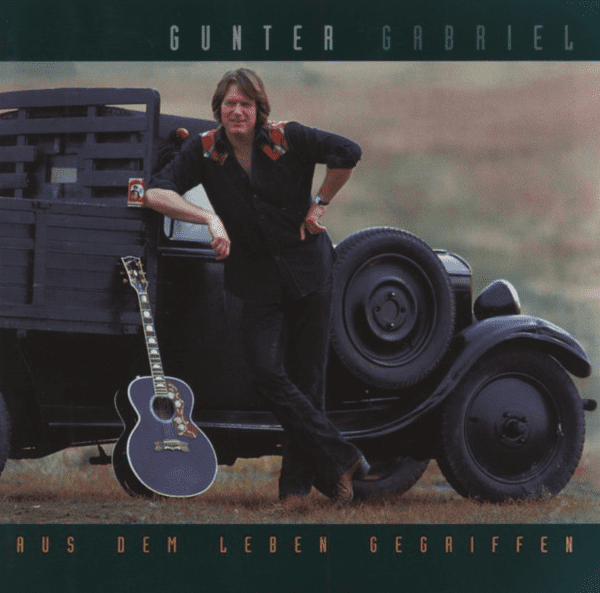 Gunter Gabriel reveals himself in the songs, his music often bears his biographical stamp. Not everyone feels addressed by it, but his followers like the honesty and passion of his everyday and asphalt poetry. The toughest boys are always the ones who cry secretly and can be incredibly romantic. 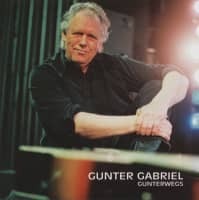 In Gunter Gabriel's deep trucker voice you can hear the loving, the irretrievably nostalgic and romantic, the unswerving belief in goodness and love at every tone. Customer evaluation for "The Man In Black - The International"
Für Cash Liebhaber ein Muss.